Matilda Dare still can’t sleep. Since she’s arrived in Goodnight, New Mexico, she’s solved one murder and had more than one conversation with a dead woman. Obsessed with finding the woman’s killer, she has to put that on hold when her newspaper receives a mysterious, coded letter. When the author of the letter winds up dead, Matilda is thrust into a mystery that puts her new friends into danger. The hunky Sheriff Goodnight and Matilda’s hunky roommate Boone are along for the ride in this funny action adventure that might end up spelling lights out for Matilda. 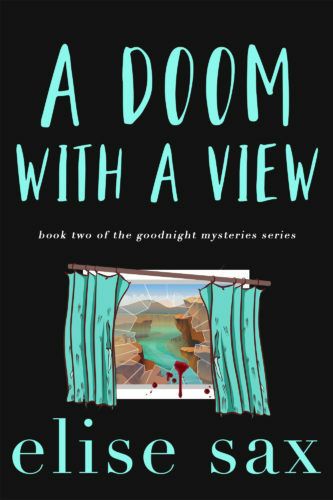 A Doom with a View is the second installment in the small town mystery romance Goodnight Mysteries series and a spinoff of the Matchmaker Mysteries. Goodnight…Sometimes sweet dreams end in murder.